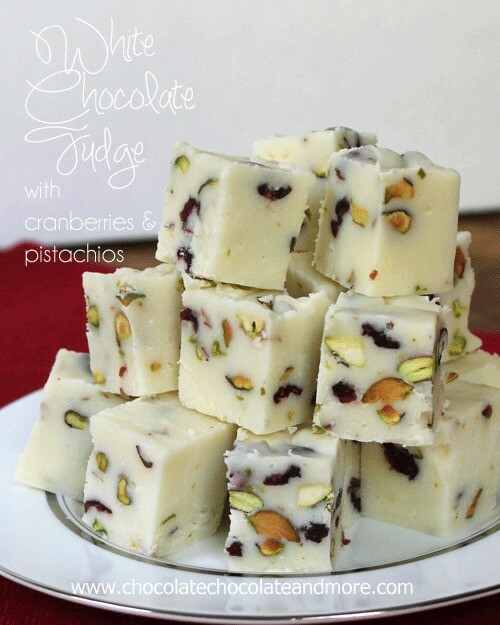 White Chocolate Fudge with Cranberries and Pistachios - Chocolate Chocolate and More! White Chocolate Fudge with Cranberries and Pistachios-full of red and green color, perfect for the holidays! I love my foodie friends. They force me to step out of my comfort zone. I’m not one to put fruit in my chocolate. Except for strawberries. There’s just something special about a chocolate covered strawberry. OK, and Pineapple dipped in chocolate is to die for. And apples, yup, apples and chocolate go well together. But Cranberries? When I think of Cranberries, I think of Thanksgiving and cranberry jelly or cranberry relish or my mom’s cranberry-apple dish that she really needs to give a name to but the kids love! So this month for the Chocolate Party the combination is Chocolate and Cranberries. I started asking around, cranberries, chocolate, hummm, then I had a light bulb moment. Fudge! You can throw almost anything into fudge. Shugary Sweets is practically the queen of Fudge. 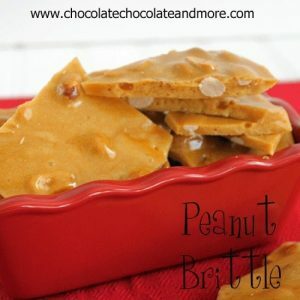 You have to check out her Peanut Butter Fudge, this is no ordinary Peanut Butter Fudge, I promise, you’ll drool on your keyboard when you see it. She even has a Cinnabon Fudge. Do I even need to say anything else about this one? So she’s my go to girl for fudge. She made an Apple Pie Fudge for our Apple Challenge recently. Looking over the recipe I knew I could easily just change out a few things and let me tell you…This fudge is amazing. For an 8×8 pan, it makes a ton! I took a plate over to our police department to share (get out of the house before I ate it all.) Most of them looked at me like I was crazy. A few just gave me “that smile” and politely took a piece. All it took was for one of them to take the first timid bite. I felt like I was in that old Life Cereal commercial. He likes it, he likes it, hey Mikey! They were all coming back for seconds, getting a piece to take home “for later,” yeah right! You won’t be disappointed in this fudge, the colors are perfect for the holidays, the taste is out of this world, it would make a perfect gift…if you can bear to part with some. Save your favorite recipes to your personal recipe box with the button on all my recipes ! Create a Meal Plan with your “favorite” recipes and the ingredients will automatically be added to your own Grocery List! Place chips in the bowl of your mixer. Have your whisk attachment ready to go. In a large (I used medium but it was close) saucepan, heat sugar, butter, salt and whipping cream till butter is melted, stirring occasionally over medium heat. Once butter is melted continue heating until you bring to a rolling boil. Continue boiling for 4 minutes (set a timer) stirring continuously. Watch that you don't let it boil over. If using a candy thermometer, the temperature should reach 230 degrees. Pour hot sugar mixture into your mixing bowl and whisk on med speed for about 2 minutes, until all chocolate is melted. Add vanilla, cranberries and pistachios and stir, just till combined. Pour into a parchment lined 8 x 8 pan. Let set until cooled then refrigerate for 2 hours until cooled. Remove fudge from pan using parchment paper to lift. Slice and enjoy. Store in airtight container. I like a fudge with no evaported or condensed milk, just chocolate and cream. Wonderful colors and it sounds so delicious! Thanks Paula, This fudge was so creamy soft, melt in your mouth! Thanks Lizzy, I can’t wait to make this again for all the Christmas parties we end up going to every year. Aimee is definitely the fudge queen. Her Cinnabon fudge is seriously to die for. She sent some home with me this summer and I didn’t share it. It was sooo yummy! I love that you used her fudge base and added the cranberries and nuts. It is so festive and pretty looking!!! Thanks Jocelyn, That Cinnabon fudge is on my list! I’m so jealous of you but at least I have Aimee’s recipes to guide me! I can’t wait to try this it looks incredibly good! I must make it when we are having lots of company because I will eat it all if left alone! Kelli, you definitely want a plan for this fudge, it’s addicting and you won’t even realize you’ve eaten 5 pieces when you go to reach for the sixth one! Carol, I wish I could share with you but this had to leave the house quickly! I’m loving the chocolate party, fresh new ideas just in time for the holidays! What a unique fudge, I would never have thought of it! But it sounds great! Erin, if it wasn’t for this challenge I would never have done it either but they go so well together! Thanks Winnie, I’m having a love affair with white chocolate these days! This fudge looks rockin’, Joan! I love the combination of white chocolate + pistachios (my favorite nut!) and cranberries. These remind me of the holdiays so much! can you believe I have never made my own fudge. I helped my MIL but on my own, never. Thanks for having the party Roxana, you always push and support me! Okay I’m not one for anything resembling fruit in chocolate…but this is so pretty it’s totally doable! hehe Dorothy, I know what you mean but there are exceptions to the rule, like chocolate covered strawberries and now this fudge! This looks awesome! I am a new follower as well. Awesome fudge recipe it looks so pretty and festive for the season. Thanks for sharing it! 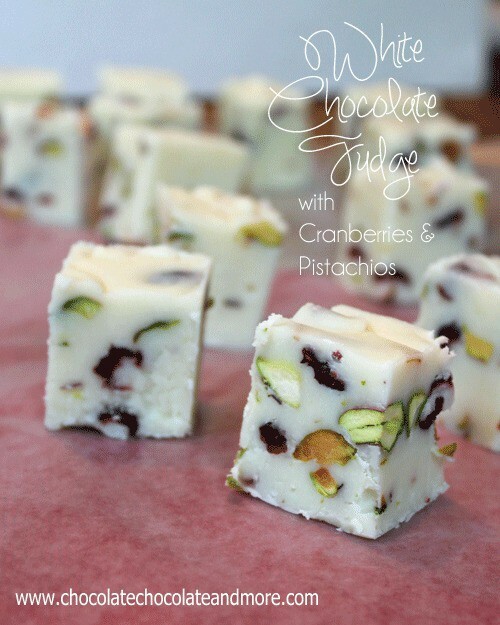 Joan, this is Christmas in fudge form – white chocolate, pistachios and cranberries look beautiful together and I’m sure it tastes as phenomenal as it looks! This looks so yummy! Thanks for linking it up to the party! Have a great day! I think I have just found the perfect, oh so special sweet for my son’s Christmas themed Bday party…..this looks so amazing. I love when I click on a recipe from a link party without knowing who’s it is and it is someone’s blog I love. Saw your white chocolate fudge on Love Bakes Good Cakes. It was screaming to me – make me, make me. I am going to have to. I LOVE white chocolate. Awww, thanks Christie!, I’m in love with white chocolate right now! 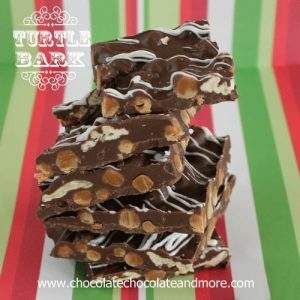 This looks so good!I always make the same fudge every year but this has inspired me to shake it up a little. Who knew you could do sooo much with fudge?? Looks so pretty, too! 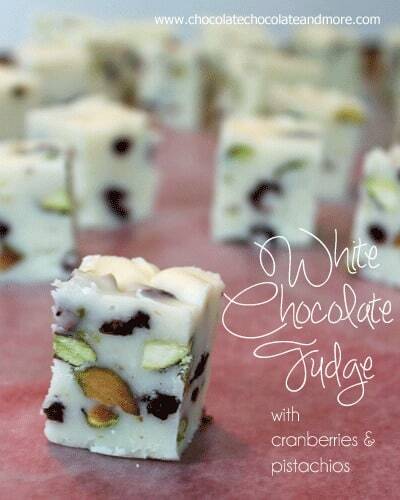 Wow, I have never thought about making white chocolate fudge but oh boy do I like the look and sound of this recipe!!! Thanks Patty, I’ll be making it again for the holidays also! I love cranberries and white chocolate! This is incredible! No way…. These look sinfully delicious…!!! oh my my… my mouth is watering! I would love for you to add it to my weekly Mom’s Library Link-Up along with any other of your amazing posts. Your fudge is so pretty, I love the cranberries and pistachios! I have always done the traditional chocolate fudge! 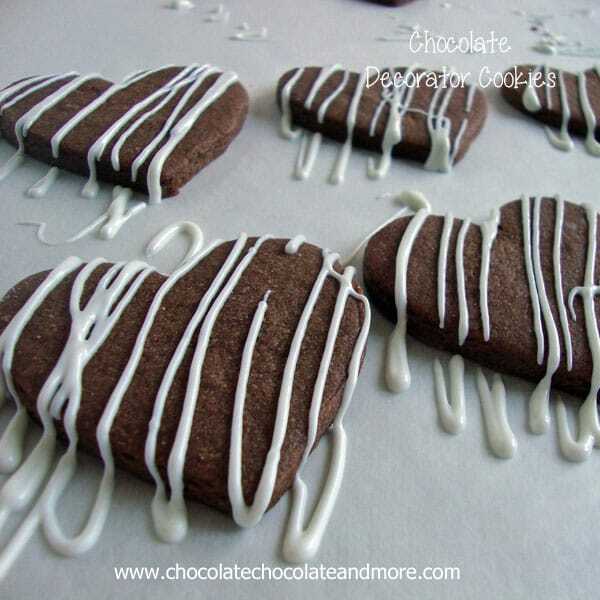 Thank you for sharing such a lovely recipe for white chocolate fudge. Love all the goodies you added to it. HEAVEN in one bite!! I LOVE THIS!! This fudge looks AMAZING!!! Perfect for the holidays! This fudge looks like the perfect holiday treat to be gifted! Love the cranberry, pistachio, and white chocolate combo, it screams Christmas. Thanks for sharing! Looks fantastic (as usual)!! Thanks for partying with us this week at Keep Calm & Link Up!! Happy Friday!! Yum! What a great combo with the white chocolate! 🙂 Have a great week Joan! Oh my this fudge looks so delicious! Thank you so much for sharing this at Wednesday Extravaganza! Joan! This looks soooo good! Love this! Pinning! Thanks so much for sharing at Mom On Timeout! Have a great week! Oh my goodness, YUM! 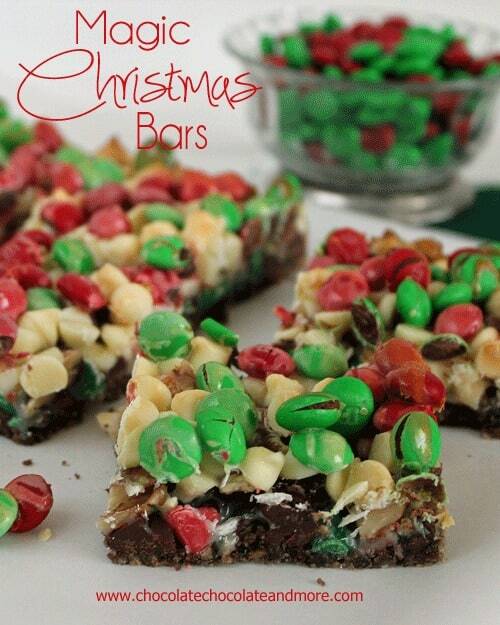 Thank you so much for sharing this scrumptious treat on the Winter Holiday Hop today! These are a truly great addition to the Chocolate Party. White chocolate has a special place in my heart. Yum-Yum! I will have to try making this. Looks sooooooo good!!! This looks so decadent I would like a big hunk to sit and enjoy. I might be in the minority here but I didn’t develop a taste for white chocolate until just a few years ago. But now when I want a sweet treat I find myself craving it. This fudge would be welcome any time, especially with your addition of pistachios. Love this! I love cranberries, and it sounds fabulous with white chocolate!! YUM! !Thank you so much for sharing at A Bouquet of Talent this week. i love my friends for taking me out of my comfort zone too and this month’s chocolate party ingredient was definitely a challenge from me…lol. Joan what a fabulous fudge!! This is going to be a must make for the holidays! I just made this and it is overly sweet.Would at least put 1 cup less sugar in. Was to be a gift but don’t think people will like it it being soooooo sweet. So sorry, you could definitely cut back on the sugar or add more pistachios to cut the sweet a bit. This looks so yummy! I found you via Pinterest, and so glad I did! I’m going to have to try this. I love white chocolate and cranberries! This looks so good. Pretty too. I have a question for you. I tried the standard marshmallow cream fudge which we make every year and it turns out creamy. Well, I tried it without changes with white chocolate chips and while the flavor was good, it set too hard. What can be added to keep it creamy. I thought of corn syrup. Didn’t want to experiment without some concrete ideas because the ingredients are so expensive. Any help you can give me would be appreciated. Do we use salted or unsalted pistachios? You can use either. If you are using salted pistachios, omit the extra salt for sprinkling on top. This years batch is on the counter cooling. Used dried cherries instead of cranberries. Can’t wait to eat it. Even the spoon tastes good. Just brought some to my hair dresser and forwarded the info about your blog to them. They loved the fudge. This recipe seems so incredible, is it any chance to get the ingredients in grams? In my country it is not possible to buy chocolate chips, so for me it is hard to get chocolate proportion right, I would be super grateful! I’m sorry, I don’t know the conversions but there are several conversion calculators on line. I just got the fudge from the fridge and cut it up. The consistency was perfect and I have never tried to make fudge before, so this was a really excellent recipe! So goad everyone enjoyed it, you can’t go wrong with dried cherries!